Over the last 12 days, the people in the great state of Minnesota have taken the time to enjoy the well-publicized, great get together at the Minnesota State fair. Television and radio commercials ads have been both seen and heard over and over throughout the day and night, billboards you just cannot miss on the highways and streets, as well as advertisements in the local papers have announced the fair. You have to close your eyes to miss the well-coordinated promotions on the behalf of this gathering. Yet, on the other hand, what most Minnesotans were unaware of was that 2 days before the fair began, unannounced by the US Stadium event coordinators, as well as the local corporate media propaganda outlets, was the stealth, Super EID Muslim “feast of the sacrifice” national conference that took place at the US Bank Stadium on August 21 and 22. As a matter of fact, up until 10 hours before this event was to take place, then and only then, was it made known by local media outlets that were now running for cover because the organizers were exposed for attempting to conceal the event. Of course, when they were discovered the event was then sold to the public as America’s version of Christmas followed up by a carnival. On their supereid.com website, which went up on July 14, 2018, it states that they are an organization dedicated to uniting the Minnesota Muslim community (Rochester, Willmar, St. Cloud, Minneapolis etc…) for a festive, family-friendly EID prayer and celebration. fifty thousand were originally expected, then it was lowered to 30,000 and then to 20,000. I personally saw no more than 3,500. Laura Bishop / Sustainability Officer for Best Buy Corp.
Why were there no notifications posted on the US Stadiums website schedule? Why was the public at large not made aware until 10 hours before the event, or given proper notice? Why were the police not notified? Super Eid “rally” features roster of scary speakers with Jihadist ties. As Islamic leaders with ties to terrorism addressed them, thousands of Muslims chanted the jihadist battle cry “Allahu Akbar” at taxpayer-funded U.S. Bank Stadium in Minneapolis yesterday as part of a huge celebration of the Muslim festival of animal sacrifice known as Eid al-Adha. “Allahu Akbar” is not an innocuous phrase. It is generally the last thing victims of Muslim terrorism around the world hear as their lives are cut short at the hands of groups like Islamic State or al-Qaeda. The phrase means “God is greater,” but there is more to it. It is a cheer that goes back to the still-celebrated Muslim slaughter of Jews at Khaybar in 628. It means the Muslim deity, Allah, is greater than the religions of those vanquished by Islam. It is an active, actionable threat to all non-Muslims, a belligerent statement of Islamic supremacy. Muslims kill non-Muslims to prove that, “Allahu Akbar”: that Allah is greater [than] the religions of their victims. The organization putting on the event, Super Eid, previously said it hoped to attract 50,000 people to the morning event and to a celebration afterwards at a nearby park. It’s not clear who funded Super Eid but it seems unlikely such a large gathering could have been arranged without major corporate sponsorship. Strangely, up until the night before Super Eid, the gathering did not appear in the stadium’s event listings. The next upcoming events listed were an Aug. 24 pre-season game between the Minnesota Vikings and the Seattle Seahawks and an Aug. 31 concert by singer Taylor Swift. Streets often run red with blood during the organized ritualistic slaughter of animals that takes place during Eid. To avoid adverse publicity, the media-savvy organizers of Super Eid opted not to butcher animals at U.S. Bank Stadium – they set up a petting zoo featuring farm animals outside the facility. Instead, they were expected to dismember animals off-site in connection with the holiday. U.S. Bank Stadium was the site of Super Bowl LII (52), a game that pitted the Philadelphia Eagles against the New England Patriots in February of this year. Although local mosques in the Twin Cities hold their own prayer services for Eid, “this year with more than two dozen mosques all coming together at U.S. Bank Stadium, they’re calling it Super Eid,” according to KMSP-TV. "I guess that is the core of what is the difference between 'Super Eid' and normal Eid," said event organizer Asad Zaman, who is also the imam and executive director of the Muslim American Society (MAS) of Minnesota. "We're doing it together. And this has a lot to do with the fact that our community is maturing and growing, and that the U.S. Bank stadium happens to be available at this time." The university's website cites recognition by Holy Quran University in the Sudan, founded in 1990 by the regime of Sudanese war criminal and President Omar al-Bashir. Holy Quran University's leaders signed a 2002 declaration saying it was forbidden for Muslims to buy American and Israeli goods. Al-Azhar has refused to disavow Islamic State. IUM embraces Islamic State beliefs, teaching its American students that "[K]illing a Muslim who does not pray, one who leaves Islam, prisoners and infidels within Islam [those who do not have a clearly specified creed or sect]. [It also allows] gouging their eyes and chopping off their hands and feet, as well as banning the construction of churches and discriminating between Muslims and Ahl al-Kitab [Christians and Jews], and insulting them at times." Maneese, who sits on the fatwa committee of the Assembly of Muslim Jurists Association of America (AMJA), wrote a 2007 paper for the group asserting that Muslims should avoid non-Islamic, non-sharia, courts, especially those in the West that follow “man-made” law. "The authority to legislate rests with Allah alone," he wrote. Maneese is also imam and president of the board of trustees of the notorious Dar-al-Farooq Islamic Center. At least five of his followers left the U.S. to fight on behalf of Islamic State. Another individual identified as a speaker at Super Eid is Asad Zaman, who helped organize the event. As noted above, he runs the Muslim American Society of Minnesota. MAS was founded by members of the Muslim Brotherhood. Along with the Council on American-Islamic Relations (CAIR), MAS has been designated as a terrorist group by the United Arab Emirates. Zaman also heads the infamous Tarek bin Ziyad Academy, a taxpayer-supported Islamist school. Local politicians participated in Super Eid. Democratic candidate for Minnesota governor, Tim Walz, took to Twitter to praise the event after attending it. In-your-face Muslim lawmaker U.S. Rep. Keith Ellison (D-Minn.) attended the event, reportedly gave a speech, and posted a photo with a fan at his campaign account on Twitter. "Joining thousands of Minnesota at U.S. Bank Stadium to celebrate Eid al-Adha. Powerful. #SuperEid[,]” he tweeted. It is unclear what Ellison, a man accused of serial domestic abuse now running to be attorney general of Minnesota, said in his speech. The six-term congressman and deputy chairman of the Democratic National Committee decided not to seek reelection in his ultra-safe seat in Minneapolis. If only the media had bothered to report what the super-newsworthy figure had to say yesterday at Super Eid. Individual Somalis may have been able to assimilate, but here they are wholesale transplanting Somalia into Minnesota in such numbers that there will be no assimilation. Moreover, there is no desire for assimilation. "Islam isn't in America to be equal to any other faiths, but to become dominant. The Koran, the Muslim book of scripture, should be the highest authority in America, and Islam the only accepted religion on Earth"
Furthermore, they are being brought in on taxpayer welfare, and literally supplanting the native populations that they are entering into. They would never be able to do this without willing assistance with Lutheran Social Services and other church groups getting big federal relocation dollars, courtesy of the U.S. Taxpayer. And to be expected, they are bringing their culture with them. Take a look at what takes place when these Muslims enter into countries that they are welcomed into. Sweden: 480,000 sexual assaults in one year. 77% of all rapes by less than 2% Muslim. England and Wales: Over 56% of Syrian refugee's committed severe crimes in less than 1 year etc. UK: Muslims fill 44%of high security prisons, out of a 5% population. 68.3 % on cash welfare. Muslim migration has doubled in the decade since 9/11 and 60% migrants to America favor sharia law (Deuteronomy 28:15-68). Local Media Attempting to Divert Muslim Primary Victories (In Minnesota)-Victory Speeches in Arabic! How true this statement is, and how many people in this country live their own little selfish lives (Luke 17:33) deceiving themselves into believing that politics plays no part in America (Exodus 18:21). While most Americans are still sleeping under this new shill administration (Matthew 13:25), there are a record number of Muslims running for governmental positions in this country. And most do not realize that they mean to implement Sharia Law in place of The U.S. Constitution, which runs antithetical (in direct contrast) to American government. In other words, Muslims mean to overthrow your form of government. After seeing this headline, the first thing that went through my experienced mind was, where are the results for the Muslims that mean to take office in Minnesota? Of course, I knew that the CIA-controlled media did not want the people in an upheaval with the knowledge that 3 Muslim candidates just won the primaries in their local government, and another one of them being the 4th, Hakim Muhammad otherwise known as Keith Ellison, who has now been accused of abuse by several ex-girlfriends. 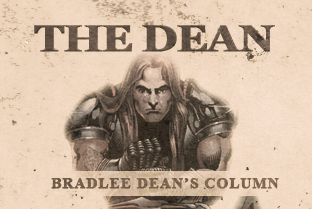 It is my understanding that Representative Keith Ellison has been making comments about me (The Daily Beast), saying to the American people that they “may not know quite how extreme this guy (Bradlee Dean) is.” Interesting. Can you say Keith is straining at a gnat while he swallows the BIG camel? I may be radical for the truth (Matthew 11:12), but I am not guilty of beating of my spouse. That aside, and first in line is CAIR-linked, Ilhan Omar. She won the primary to replace (domestic abuser) Hakim Muhammad-Keith Ellison in Congress. WND reported Ilhan Omar, the 34-year-old community organizer who came to America as a refugee from Somalia, was touted by Democrats as a model success story. But on Thursday, Omar made her mark in another way. IIhan Omar also has ties to CAIR which is tied to Hamas as well as the Muslim Brotherhood. Watch here Islamaphobia playing the victim speech here. Third up was Mohamud Noor who won the Democratic primary race for Pro-Sharia Ilhan Omar’s seat in Minnesota legislature. He’ll become the first Somali man to be elected to a state house if he wins. Remember, the goal of the Muslim Brotherhood is to infiltrate our Government and implement Sharia and destroy us from within! There is only one way to correctly end this column: get busy, your present and future state depend upon it (Leviticus 26:15-21).